One of the true joys in Astoria is dining al fresco at one of the many amazing restaurants and bars in town. While sidewalk dining is easy to spot, more elusive is the open backyard, garden, or patio behind many of these establishments. Here are some of the best places in Astoria and Long Island City to find such an outdoor delight. Brought to you by the guys behind the popular Vesta Trattoria, Pachanga Patterson elevates simple Mexican food to new heights. There you'll find moo shu duck tacos, the popular "Veggie Jenga" and some of the best guacamole in town. Not long after opening for business, Pachanga Patterson unveiled its sunny backyard or outdoor dining, just in time for the warm weather. The cedar patio and fencing were built by hand, there are plenty of tables sporting festive umbrellas and their benches were built from reclaimed materials. Il Bambino has one of the loveliest backyard spaces in Astoria. There's enough seating for around two dozen people amongst the reclaimed wood tables and cloth awnings. For large groups, there is a nice table in the back in a sizeable nook of its own. Enjoy a cool glass of wine (the Rain Sauvignon Blanc is particularly nice) with cheese and charcuterie on a warm afternoon - Il Bambino's patio space is perfect for that. Fatty's small backyard garden has many fans, and the space is often referred to as an urban getaway. You'll actually have to enter the garden from the west side of the building, which is not too much of a problem, as Fatty's is right there on the corner. Enjoy a well-made mojito and maybe some maduros to snack on as you relax in the laid-back atmosphere. In the spring and summertime, Michael Angelo's II announces the opening of its backyard garden on the sandwich board in front of the restaurant, and it's definitely worth checking out. It's actually quite large - close to the size of the inside dining room. The decor is rather sparse, but the hospitality is, pleasantly, quite the opposite. It's a great space for a large group and the staff is very accommodating. On some nights, you might even hear one of the owners crooning some classic Italian tunes out there. One of Astoria's more expansive back patios is at Mojave. You may be quite surprised when you see it for the first time - it's huge. Not as huge as the beer garden, but it's big. There are plenty of tables with umbrellas and even a fountain bubbling back there as if urging you to relax. Enjoy a delicious margarita, mojito, or even the agave-sweetened iced tea while you chill out for the evening. Sweet Afton's backyard patio is really a hidden gem. The space is surrounded by tall walls and there's greenery everywhere. There are several tables with a higher bar along one of the walls. It feels secluded out there, which is a nice contrast to the hustle and bustle of the surrounding city. If you're there for brunch, consider the Witte Screwdriver, or really any one of the tasty and inventive cocktails. To find the backyard at Creek and the Cave, head inside the dining room and descend the stairs on your left. Take a few more steps and you'll find yourself in a sweet patio that is perfect in the summer. One of the great things about the Creek is that they serve Sol beer, regarded by some as a superior version of Corona. So have a cold one and enjoy one of the nicest patios in Long Island City. Leng Thai's backyard gets high marks from many Astorians. It's often referred to a 'zen," perhaps because of all the bamboo back there. It's lovely and relaxing. Astoria is fortunate to have two quality beer gardens to choose from, and they use them frequently. Studio Square has the benefit of extensive beers on tap - not to mention sangria on tap - and the very cool fire pit out in the garden. Beer Garden has history on its side, plus a menu of tasty Czech and Slovak specialties along with great central European beer. 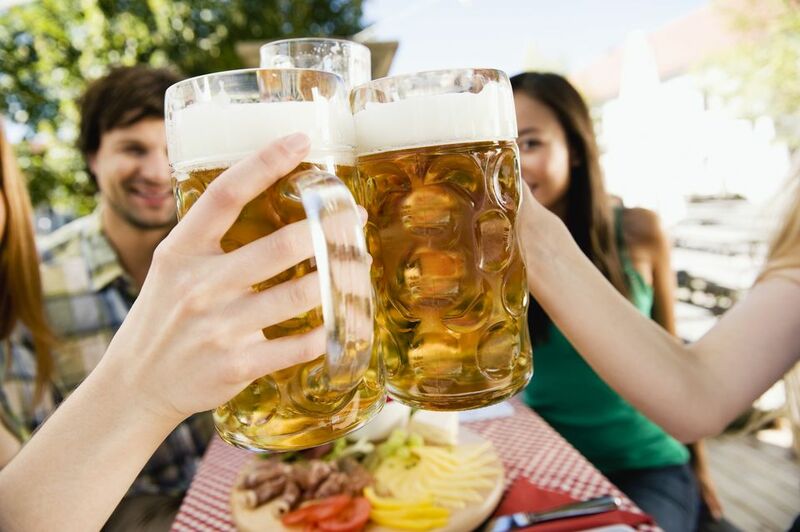 Both places are perfect for enjoying a pint or a stein on a lazy warm afternoon.